Abstract. 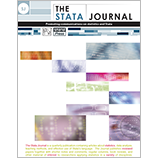 In this article, we adapt the modeling strategy proposed by Philips, Rutherford, and Whitten (2016, American Journal of Political Science 60: 268–283) and create a user-friendly Stata command, dynsimpie. This command requires the installation of the clarify package of Tomz, Wittenberg, and King (2003, Journal of Statistical Software 8(1): 1–30) and uses the commands in the clarify package to produce estimates from models of compositional dependent variables over time. Users can also examine how counterfactual shocks play through the system with graphs that are easy to interpret. We illustrate this with a model of voter support for the three dominant political parties in the UK.